The Export to Sprite Sheets dialog allows you to export your rig into a sprite sheet and its animation into animation metadata, in a package that can be directly imported into Unity using the Harmony package for Unity. To export all the clips for your character, you will need to start by exporting the sprite sheet from your base scene, then open each scene version and export their animation clip one by one. Add as many frames to your scene as there are drawings in the layer with the most drawings. Leave the first frame with the drawings for your character's normal poses. In subsequent frames, expose the other drawings in each layer until every drawing used for all of your character's animation clips is exposed for at least one frame. In the Game toolbar, click on the Export to Sprite Sheets button. The Export to Sprite Sheets dialog appears. Under Existing Clips, make sure the Use Scene Markers to Export Clips option is unchecked. NOTEScene markers are not supported in Harmony Essentials. They are supported in Harmony Advanced and Harmony Premium. Select the Sprite Resolutions tab. This tab contains a list of all the resolutions in which your sprite sheets will be exported. For most usages, the other default parameters in the dialog should be fine. 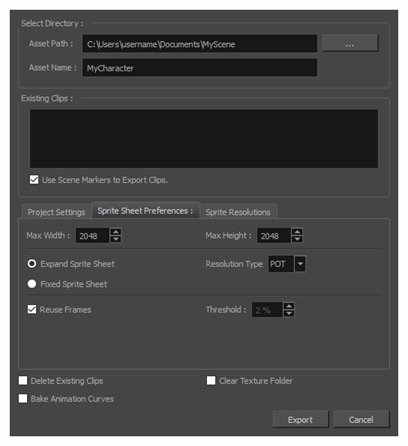 To learn more about the parameters in the Export to Sprite Sheet dialog, refer to Export to Sprite Sheet Dialog Box. Repeat steps 5 to 14 to export the animation for this scene version. Make sure to export in the exact same directory in which you exported the sprite sheet for your base rig.